We promise we will not share this with anyone! Please select the items you're interested in learning more about. Please tell us what else you're interesting in contacting us about. 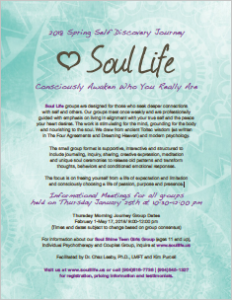 Soul Life groups are designed for those who seek deeper connections with self and others. Our groups meet once weekly and are professionally guided with emphasis on living in alignment with your true self and the peace your heart desires. If you are interested in a total life re-boot, contact us to learn more about our 12 week Life Transformation Program. We customize the therapeutic interventions and offer one-on-one guidance in all areas of your life. With the Soul Life, Whole Life 12 week Transformation Program. Are you interested in learning about raw, vegan cooking? Contact us to learn about our co-op cooking classes. We will each prepare sides, salad dressing and raw desserts to share. Fun in the kitchen!